Forever My Daddy, the company is dedicated to advancing the cause of fathers who, despite divorce, are dedicated to their children. The voices of fathers are too often silenced and discouraged by the actions of the courts and former spouses. There is an unseen blindfold over the eyes of children of divorce. Many actually think they are fatherless. They think that they are raised in a single-parent home by a single mom. The ears of the courts are covered. Meanwhile, fathers, grandparents, and others are frustrated in their desires to provide emotional support to the children. The purpose of Forever My Daddy LLC is to enable willing, eager, and helpful fathers to participate as fully as possible in the lives of the children they love. The concept of Forever My Daddy emerged over ten years ago. 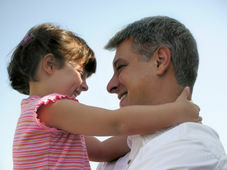 FMD is the voice for fathers who are unfairly pushed away from their children, and blocked from developing a deep and true relationship, whose desire to be a loving presence for their children is thwarted by subtle actions of the prior spouses and the biases of court systems that actually serve to increase fatherlessness. Forever My Daddy expresses the love that is unfortunately kept away from my children. The book is written to them. The book is also intended to help other fathers find their voice and renew their courage to overcome the obstacles to fuller participation in the lives of their own children. Forever My Daddy, the book, has become my therapy and hopefully will one day be healing for my children as well. It shares the love that the courts and former spouse do not allow the children to receive. The stereotype of the "dead beat dad" prevents many people from seeing the potential for love and healing, and the benefits of a father's presence for children whose parents are divorced. Forever My Daddy is therapy for all families, a tribute to the power of fatherly love, a source of insight into the discouragements facing the many fathers who are not allowed to develop the relationship that they want to with their children, a call for society and the legal system to re-examine existing procedures and prejudices, for the sake of the children and the love they deserve. FMD Grand Foundation Inc. is a foundation dedicated to fathers and grandparents who are affected by the court systems and adverse actions of former spouses. These fathers and grandparents are prevented from developing the relationship with their children and grandchildren that both they and the children deserve. The Foundation is an educational platform consisting of workshops and speakers, men and women, who teach others methods and actions that help promote the relationships between themselves, their children and grandchildren. Workshops include topics such as prenuptial agreements, grandparent rights, targeted professional occupations including medicine, professional athletics, government officials and high powered corporate executives with their potential pitfalls. Topics also include discussions regarding the roles of therapist, court systems, school teachers, and also options to pursue when the children hate their father yet do not know why.